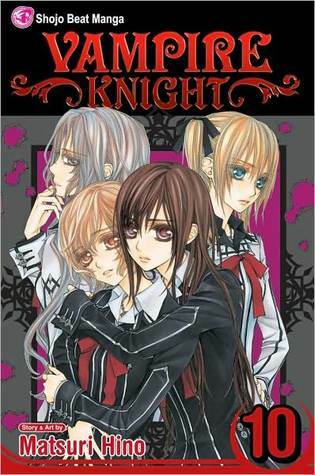 I'm still nonplussed about Vampire Knight, because it keeps getting stranger and stranger. But there are still some nice moments in this volume. We begin just after Zero kills Rido and Kaname kills the entire Senate. This series certainly doesn't refrain from killing. Zero has pledged to kill all pureblood vampires, including Yuki. He ends volume 9 and starts Volume 10 pointing his gun at Yuki, but he can't do it. Yuki has always been there to protect and love him, even knowing all his flaws. When Kaname comes back and sees Zero about to kill Yuki, he's understandably furious. He would have killed Zero if Yuki hadn't stopped him. Meanwhile, the Vampire Hunter Society has decided to destroy the entire Night class of the Academy. Headmaster Cross will not stand for that. He kills the president of the Society. Inside the school, the Day students are no longer in the dark. They know that the Night students are vampires. To their credit, school loyalty prevails on both sides. The Night students pledge to protect the Day students and the Day students remain loyal to the Night students. Like the last several volumes, Volume 10 is very confusing. A lot of things aren't properly or clearly explained. For example, Zero's body has been surrounded by brambles or the "Bloody Rose" for the last few volumes. There is some reason for this, but I haven't caught it yet. It just looks weird. I'm curious to see where Vampire Knight goes, but I'm getting more and more frustrated. Great review, Alison. I agree that Vampire Knight is quite confusing and right now in the Japanese released it's far more confusing than one could have imagined. I'l really looking forward to where Hino is taking us. It's curious and unpredictable. You should have seen me when I first read this series. I read all 10 volumes in one sitting and my friend was online. I kept stopping to ask her questions and freak out and all she would say is keep reading. Its strange because you're told one thing and you think that's the answer to the mystery but then you find out there is more and then more and it just gets frustrating after a while because you just want to know what the answer is. What's funny is that I actually like the complexity and mysterious road that Hino is taking us. That small moment between Zero and Yuki broke my heart. I just love them together. I'm just glad that she actually she's it and acknowledges her feelings toward him too. I've seen the anime but I haven't read the manga, it sounds a bit different so I'm curious now! Thanks for stopping by the Wormhole! My favorite May read? I guess I would say Angel Burn. Although I enjoyed them all. Happy reading. I answered your question over on my blog just in case anybody had the same inquiry. But yes, definitely the Darynda incorporates the scenery of the desert very beautifully in the book, and in such a humorous book you wouldn't expect that, you know? I appreciated getting that slice of intel into a climate I've never experienced personally before. Thanks for stopping! Sorry to hear you are confused about this volume! I hope you figure out what's happening in the recent volumes. Thanks for another great manga review!